Having a Smartphone is not a big deal nowadays. It has become so mainly due to availability of Smartphones that are suitable for different budgets. Although there are a number of exceptions, major issue of low-budget Smartphones is their lower screen size. Albeit the fact that you might not face issues while performing common tasks like listening to music and messaging on WhatsApp, the notable issues will be when you want to manage information in your device such as editing contacts, downloading applications massively, managing media files including videos and music etc. It is likely that these managing sections will be a problem even in a Smartphone with big screen size. MoboRobo is one of effective solutions to solve this issue of small screen size, and is available for Smartphones running on Android and iOS. Of course, MoboRobo has proved its effectiveness since its launch and we’ll go deep into this application so that you can understand why and how should you use MoboRobo to simplify process of Smartphone management. 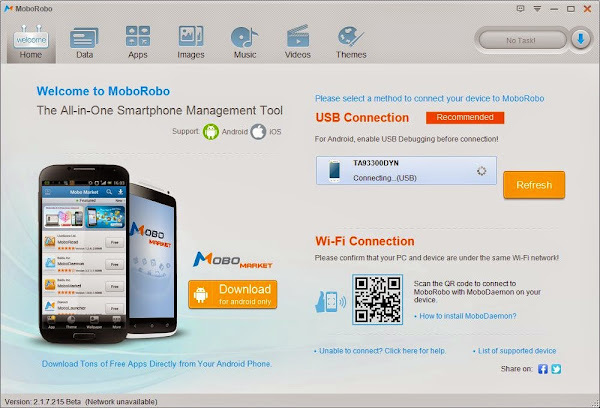 First, we will have a brief and basic introduction to MoboRobo as one of the best Smartphone management software. As we go further into MoboRobo, we can understand its multipurpose behaviour. Well, if you are just considering MoboRobo as an application, we can label it a Smartphone management tool, which does offer support for devices running on Android and iOS (iPhones). If you have the latter device but do not have a Mac to get the full-fledged management experience, MoboRobo will be damn useful for you. In addition, even if the Android Smartphone you have does not have a dedicated management tool, you can understand its value. And, the best part of MoboRobo is that it is completely free to use. Furthermore, MoboRobo is useful for both Smartphone users and vendors. There are a number of tasks that you can complete using MoboRobo, ranging from basic level to expert. Now, we’ll have a look on notable tasks you can accomplish using this Smartphone management tool. As we have mentioned earlier, you can use MoboRobo for a number of purposes. Some of those notable tasks are as follows. If you are one who runs experiments in your Smartphones, more probably in an Android device, data backup feature of MoboRobo is a wonderful solution, as it lets users backup and restore information in an easy way. Backing up your data is an easy task in MoboRobo, and you can do it right from home screen of MoboRobo. Using this feature, you’ll be able to back up variety of information; it includes contacts, call logs, music files, themes, wallpapers, messages as well as images. You can store these backup files in a secure place in PC and use it to restore if you come to lose data from device in any manner. In addition to this, ability to import and export contacts in a convenient format will help users transfer contacts from one platform to another — Android to iPhone or vice versa. More often than not, downloading applications from Google Play Store and installing them in your Smartphone is an extremely tough task, especially if you are having a slow internet connection with you. Moreover, when it comes to Smartphone vendors, it will be a tough task to satisfy those customers, who want you to install standard apps in the device before they buy it. However, MoboRobo is an effective answer for both these issues. The section to manage applications in MoboRobo is quite helpful in installing multiple applications in your device right from your PC screen. Likewise, you have an option to transfer applications from phone memory to MicroSD card if you have both in your device. The most noticeable advantage of this application management section is that you will be able to save hell lot of data, as you will not have to spend your 3G data for downloading applications. To make these things simpler, MoboRobo consists of an integrated application store, from which users can download popular and useful apps in a matter of seconds or minutes. 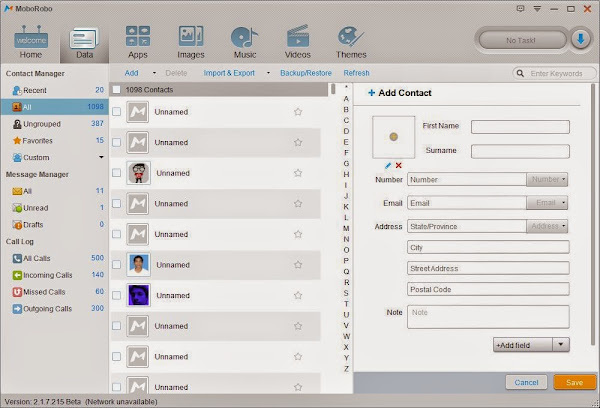 If you have found contact management in device a tough task, this feature will help you a lot! In the contact section, you can find an option to edit contacts. When compared to your small screen, editing contacts using MoboRobo is an easy task, as you can use your keyboard and mouse to perform this task. Just like the case of contacts, message section of MoboRobo is helpful in managing your SMSs right from your screen of your PC in such a way that you won’t have to get up and take Smartphone in order to reply to your texts. Replies will be available in the application instantaneously. Altogether, this section of MoboRobo is worth praising, indeed. MoboLive is an Android launcher that comes from same family of MoboRobo. If you have installed MoboLive in your device, you can use this Smartphone management tool to download and use MoboLive themes in your device. With no doubt, this section of MoboRobo is something superb as far as customizability of the Android launcher is a part of your concern. 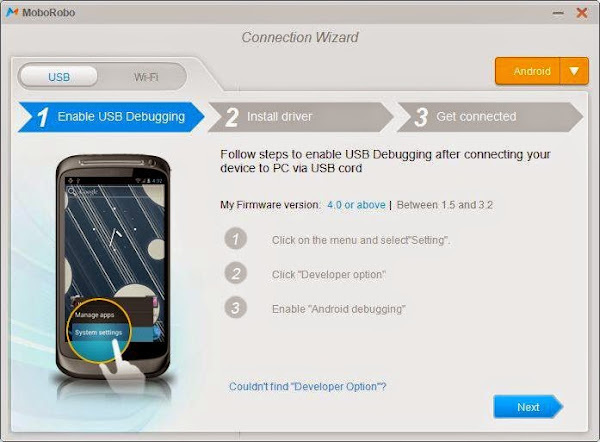 It is not necessary that you have to connect your long USB cable to connect your Smartphone to PC, because it offers a feature to connect your PC to device using Wi-Fi connection. Obviously, it will be great if you are looking for fewer wires in your life. We were damn impressed by this application, as a great tool to manage your Smartphone! Particularly, we loved the intuitive user interface of MoboRobo. However, we are eager to know your opinion about this tool. A very well crafted and informative article, providing means to manage our smartphone. Indeed very informative and useful. Thanks for posting it. 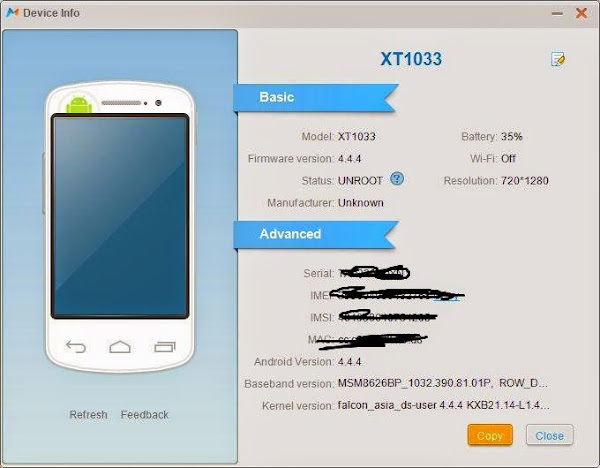 It is a great tool to manage Android Smartphones. There is no need to install driver for different phones. I am using it from 1 year.